A month or two ago, I was starting to get really antsy about one of the fabrics that I hadn't been able to find yet. 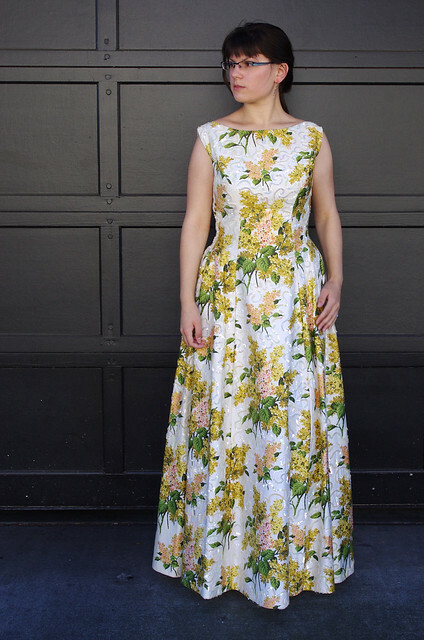 I scoured local fabric shops, asked about special ordering, and looked online. I finally got a swatch in the right color from an online fabric retailer, only to find that the fabric was twice as thick as I wanted and $85 a yard. For some reason, the fabric that I was looking for - bubblegum pink in a wool crepe, or really any blend of natural fibers - was just... non-existent. 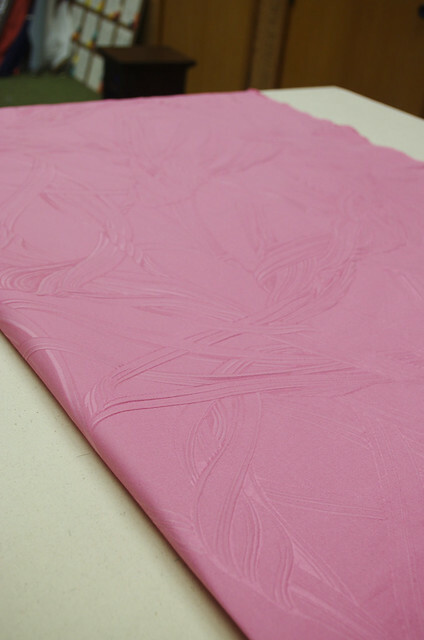 So I enlisted my mom's help, and she ended up taking a day trip down to Portland to look for my elusive pink fabric. And she not only found my color, she found it in two different fabrics: a wool with a textured stripe, and this cotton & silk damask with a rope pattern. I ended up choosing the damask, since I felt as though it would fit the collection better. So Sunday night, I stayed at school until midnight cutting out the new dress. It's a sleeveless pink version of my black dress, and I'm hoping that it will read as a kicky retro cocktail dress - just a little bit more fun than the black dress. I'm going to start sewing it tomorrow, and I'm excited to see how it works up. Things are happening! This has been a tough week personally, but a very productive one at school. Lumberjack went down to Portland for a work trip, so I've been sewing my little face off every day. 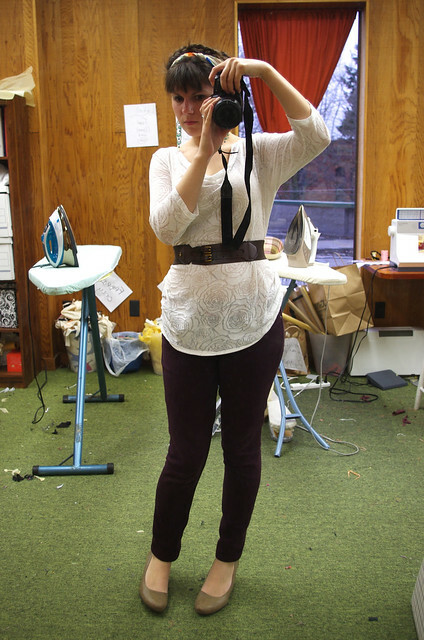 In the last two days alone, I've cut and sewn an entire garment - the little blouse above. Hopefully I can do a real finished object post soon. It was originally going to have a mesh yoke, but I decided as I was cutting it out that using my extra cream jersey would eliminate the problem of finding a bra that fit properly underneath it. 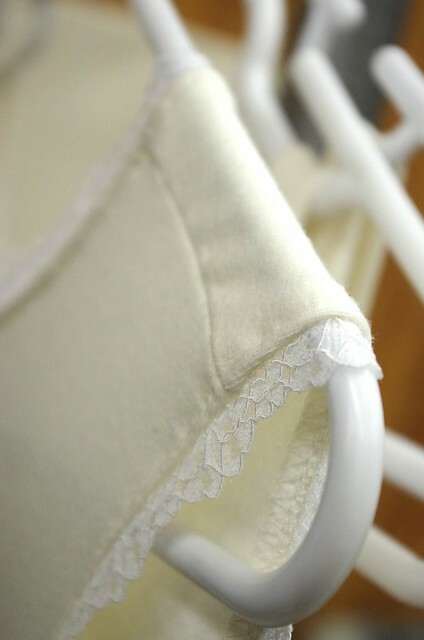 This way, it maintains the feel of the illusion sweetheart neckline, but the cream is a little higher contrast, and there won't be any bra straps showing through. Overall, it's a punchier look than I had originally imagined, but I love it. Bonus: it looks like a strawberry milkshake. 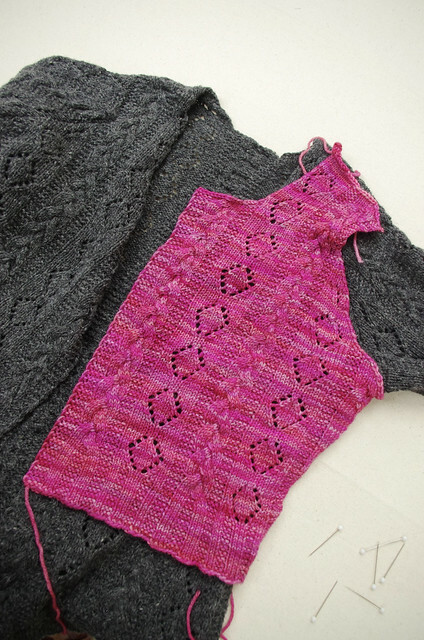 I've also made progress on my second sweater prototype, which is a cropped version of Ondrea. 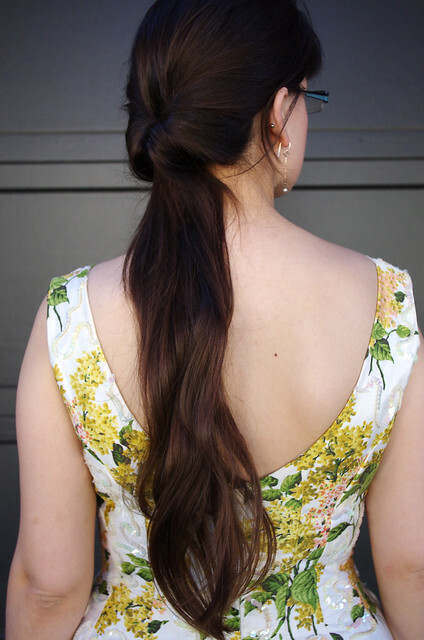 I pinned it to Ondrea today to double-check the length, and it hits in just the right place. I've actually already started the Loft version already, but I'm actually loving the prototype version a lot. 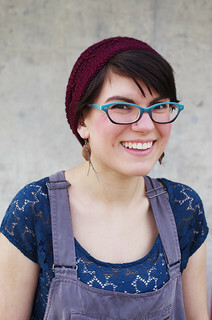 It's knit in Malabrigo Arroyo, a gorgeous sportweight merino yarn. I've been striping the skeins, since there was a slight color variation between them. I haven't knit in a few days, but I'm hoping to remedy that this weekend! In general, I'm really enjoying how each garment I make is subtly related to the others in the collection - a neckline here, a color there. I am getting more and more excited about seeing them come together, and it's pretty cool to have them lining up on the rack all cute and finished. Total count: 2 skirts, 1 dress, 1 blouse, 2 camisoles, 1 not-quite-finished cardigan, and my black dress, which only needs a hook & eye and a final press! 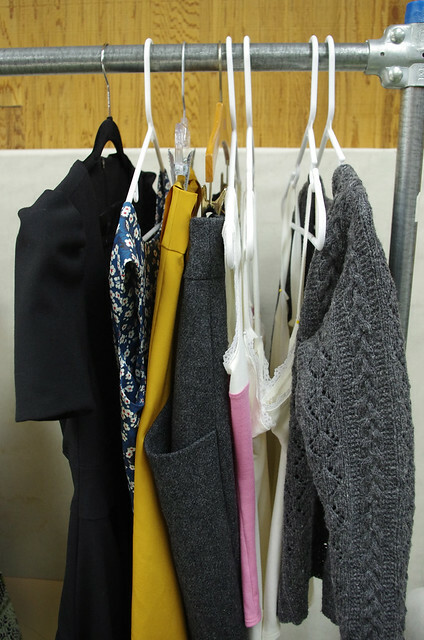 To go: 2 skirts, 2 dresses, 1 blouse, and 1 cardigan. 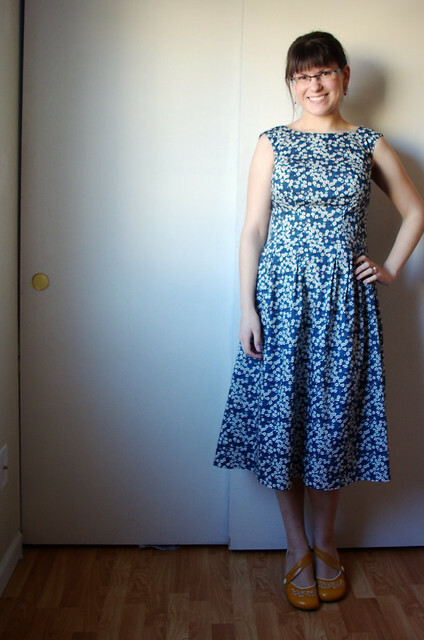 I finished hand-tacking the facings onto the first dress in my collection this morning - stick a fork in her, she's done! (Except for the hem - that comes after model fittings.) I'm calling her Emma, since her shape is based on my beautiful vintage Emma Domb wedding dress. She's the least complicated of my dresses, which makes me a little nervous, but I worked really hard to get the fit to where I wanted it, and I'm very happy with the result. I absolutely love the fabric, and I think that the style and color of the dress fits in my collection perfectly. One dress down, two more to go! Well, technically I haven't finished the dresses - and the black dress is for me to wear the night of the show! 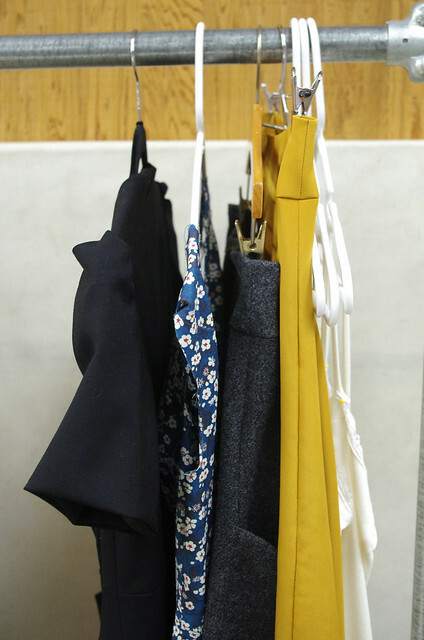 - but above is a sneak peek of the garments I'm working on: two skirts, two identical camisoles, and two dresses. Each piece creates its own problems to solve. Cotton doesn't like to ease! 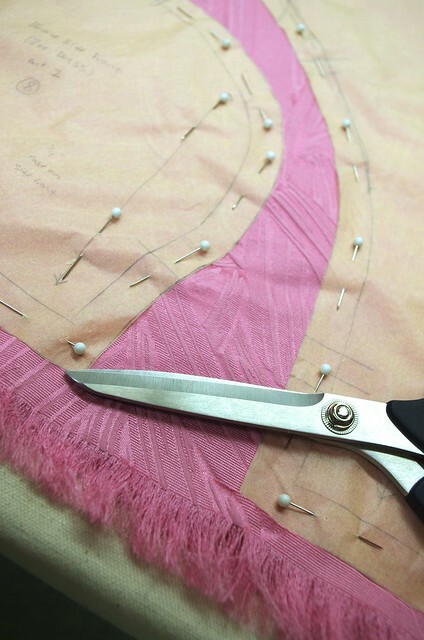 Gapping in the waistband of the skirts (now fixed)! 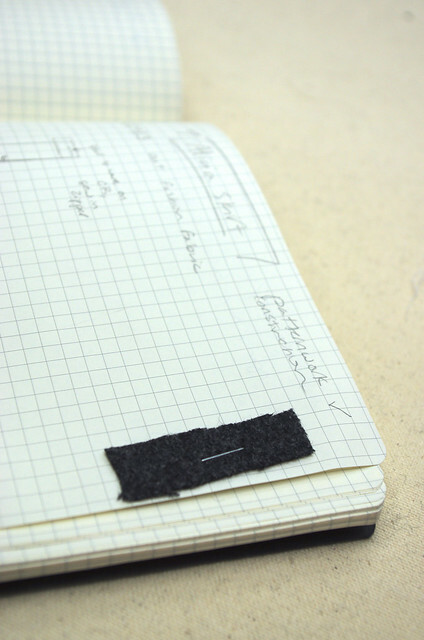 My grey wool fabric is very thick, so the seams it makes are ridiculously thick! 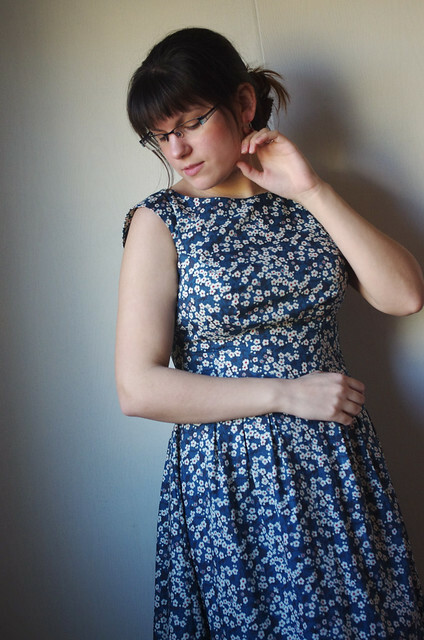 Right now I'm working on some fit issues with the blue cherry blossom dress, but other than those tweaks, I'm really excited about it. 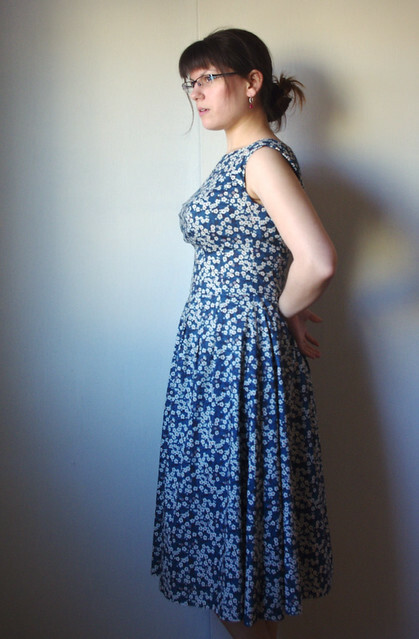 It's a tea-length boatneck dress with a full skirt and a deep v back neckline. 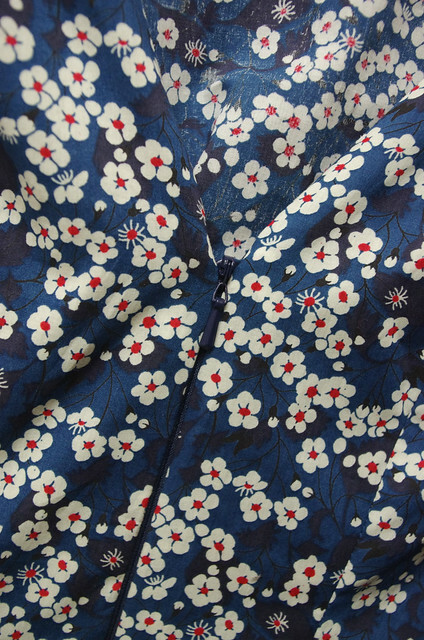 The fabric is incredible to work with - it's Liberty Tana Lawn that I first showed you here. (Plus, I am getting awesome at putting in invisible zippers.) And today, I figured out the answers to not one, not two, but four questions about garments in muslin or fashion fabric. A pretty solid day, even though it means way more work for tomorrow. Last week? Was not such a triumph. 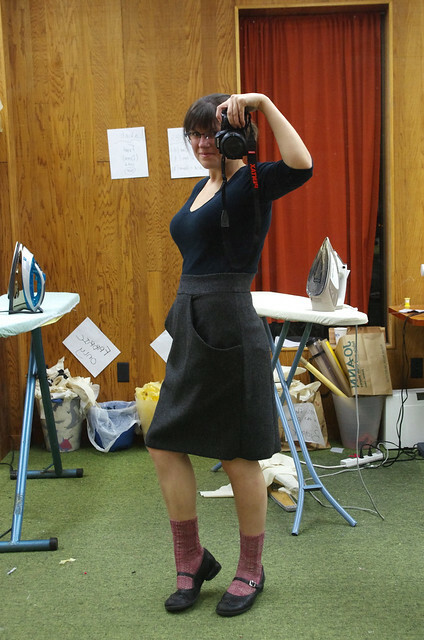 I discovered the waistband problems in both skirts, which took me three work days to fix. Everything I worked on sucked. I was feeling the same way yesterday, so this morning I felt like putting some actual effort into my appearance to make up for crappy progress. 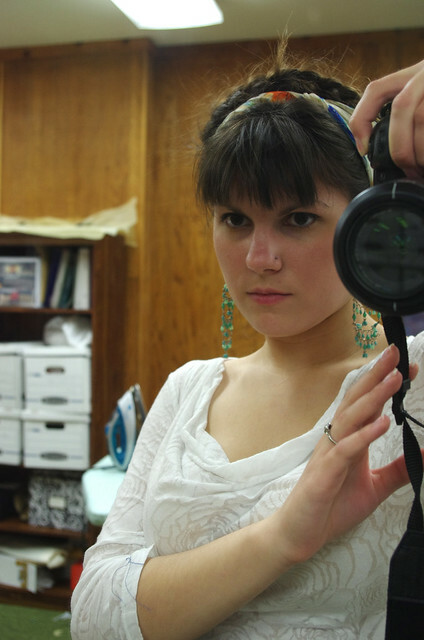 Judging from my face, fashion is serious business. But hey, I put on makeup! And braided my hair! And accessorized! That's about 98% better than my usual day, which involves rolling out of bed into a pile of t-shirts and questionably clean pants. Gold star today, Adult Cory! It's been almost a week coming. 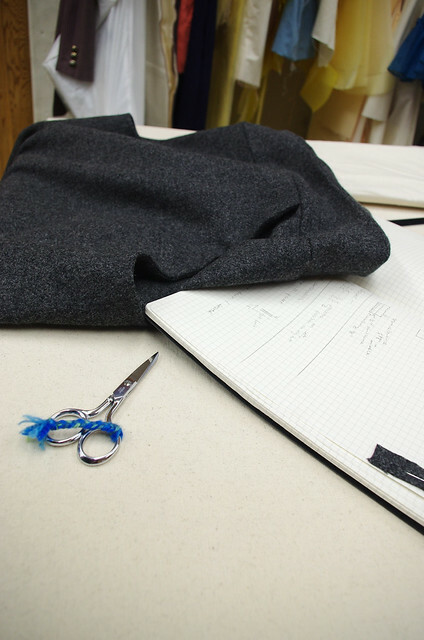 I cut early last week, consulted the tailoring teacher for tips on constructing the pocket on Thursday, and planned to finish it on Saturday. (That totally didn't happen.) So today, I came in with determination. I finger-pressed hot seams with my hands for almost an hour. I sewed; I ripped and re-sewed; I cursed; I serged; I pressed, and pressed, and pressed, and pressed. 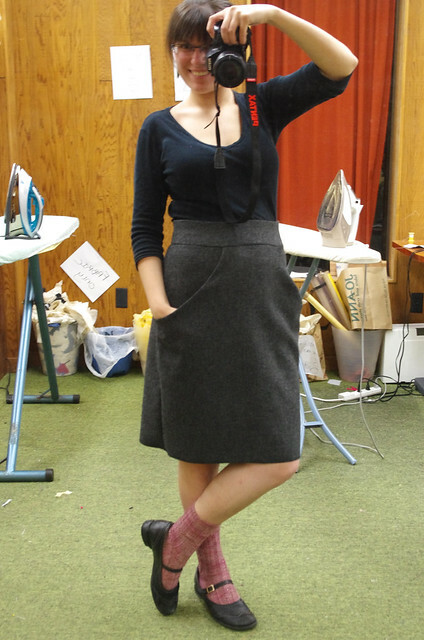 And now, the Alicia Skirt is done. I love it. I want at least five different versions of it in different colors in my closet. It's the perfect balance of waist definition and hip exaggeration. It has pockets. It is, hands down, the coolest thing I have ever made. I designed it. I made the pattern. I sewed the muslin. I cut it and sewed it and it's done and it's mine. Seeing it on the hanger tonight suddenly made the fashion show feel very real, and it made me realize that doing this is huge and scary, but it will also end. On April 13th, I will be the designer of a collection - for better or for worse - and what I do with it from there is up to me. Even though it's mostly terrifying, it's also pretty exciting. 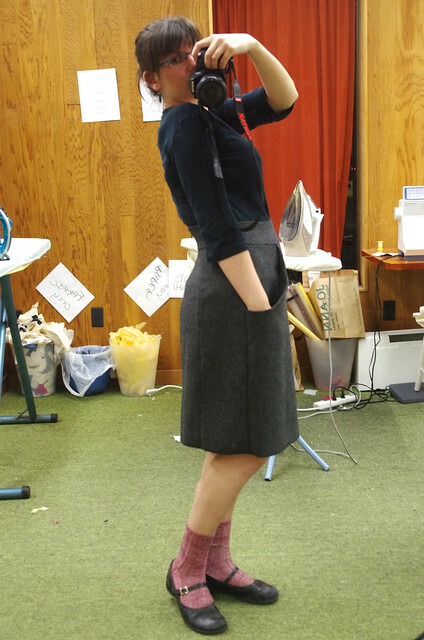 So this skirt isn't perfect; the other clothes I'm going to make won't be perfect either. But I can forgive myself for that, because the important thing is that I'm learning, and that I'm constantly trying to make something better than the last thing I made. And in the meantime, I'll accept this one as a win.